Getting older does not mean losing the zest for life or the ability to be productive and creative. In addition to being physically healthy, many seniors retain healthy cognitive function. However, some older adults need help to maintain their cognitive health. Seniors who want to remain healthy as they age can benefit in a variety of ways when they receive professional non-medical in-home care. Oshkosh, WI, Home Care Assistance is here to help your loved one accomplish daily tasks, prevent illness, and focus on living a healthier and more fulfilling life. These renowned older illustrators continue demonstrating their creativity and talents and serve as an inspiration. This English illustrator specializes in the realm of fantasy art. However, he claims the stunning landscapes in his creations are commonly inspired by the picturesque views of Dartmoor. Froud is responsible for the conceptual designs of many famous films, including Labyrinth and The Dark Crystal. His illustrations are also found in many books, including The Goblin Companion: A Field Guide to Goblins, Faeries, Good Faeries/Bad Faeries, and The Runes of Elfland. Panter has an accomplished career as a cartoonist, a designer, a painter, and an illustrator in addition to being a part-time musician. His more recent works are found in the new wave comics movement. Panter’s illustrations have been showcased in many different magazines and newspapers, including Raw, Rolling Stone, and Time. His set designs for the TV series Pee-Wee’s Playhouse won him three Emmy awards. Other recognized works include Facetasm, Jimbo: Adventures in Paradise, and Jimbo’s Inferno. Along with being a writer, Pérez is a noted comic book illustrator. His visual art has been featured in comics such as The Avengers, Teen Titans, and Wonder Woman. Many writers cite Pérez as one of their favorite collaborative artists. Coker’s long illustration career includes works found in Mad magazine and the character designs for Rankin-Bass animated films. He has also worked on various advertising campaigns, illustrated more than 375 articles for Mad, and helped create the characters and visuals for such beloved holiday shorts as Frosty the Snowman, Rudolph’s Shiny New Year, and Santa Claus Is Comin’ to Town. His illustrations also introduced the long-running Horace and Buggy and Lancelot comic strips to the public. Berner is a popular German graphic designer and illustrator. She is most known for her series of children’s books titled Wimmelbuch, which have sold more than 500,000 copies worldwide. Her works have also included more than 80 books for children and young adults, along with more than 800 book covers. Her contributions to art and children’s literature won her the coveted Hans Christian Andersen Award in 2016. This cartoonist and illustrator hails from England. His best known artistic endeavors are easily recognized in the children’s books written by Roald Dahl. Blake won the Hans Christian Andersen award in 2002. From 1999 through 2001, he was the inaugural British Children’s Laureate, and he has also long been a patron of the Association of Illustrators. 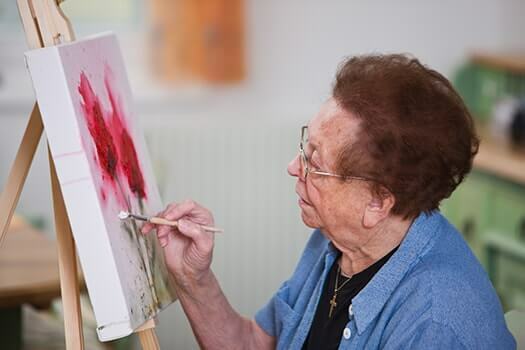 Staying creative in the senior years can stave off dementia. If your loved one has already been diagnosed with dementia, engaging in mentally stimulating activities with a professional caregiver can be beneficial. For trusted and reliable dementia care, Oshkosh families can turn to Home Care Assistance. We are experts in caring for seniors with memory-related conditions, our caregivers are available 24/7, and all of our dementia care programs are backed with a 100% satisfaction guarantee. The same applies for seniors who have been diagnosed with Alzheimer’s disease. If your elderly loved one is living with Alzheimer’s and needs help managing the symptoms, turn to Home Care Assistance, a leading provider of Alzheimer’s care. Oshkosh seniors can rely on our revolutionary Cognitive Therapeutics Method (CTM), an activities-based program that helps slow cognitive decline and delay the onset of Alzheimer’s disease. CTM also encourages seniors to engage with others in an enjoyable way and helps them build new routines to look forward to. To learn more about CTM and our premier Alzheimer’s care, please give us a call at (920) 710-2273. What Are Common Dental Issues for Older Adults?